Girish Sant died of a heart attack in a hotel in Delhi yesterday. `Bandya', as he was known to friends, could have chosen any career when he stepped out of IIT in 1986. He chose the less travelled path of taking interest in the public policy, and applying himself to a combination of technical mastery and the dogged persistence that is essential to making a difference. 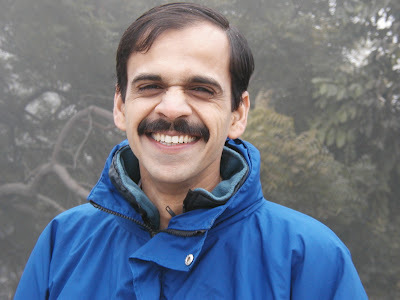 He founded a think tank, Prayas, which has come together as a pretty unique organisation in the Indian landscape. The Indian development project desperately requires more people who combine his intellect with his commitment to fixing up the world. I always thought of Bandya as a gentle giant. He combined a soft and understated personality with depth of knowledge. When I spoke with him, I was always running at 100% CPU utilisation. On a more personal note, Bandya was a lead climber in the first ascent of Konkan Kada, and I was part of that team. That was a peak experience. We will miss him. My deepest condolences to you and their family. It is so saddening to know that an activist passes away in such a young age. May his soul rest in peace. A very shocking news. It seems not fair. I just cannot sleep without thinking about this. We went to same high school and shared beautiful memories while in IIT. His cheering face, view life with positive attitude and passion for environment will always stay in my memory. Really shocking news Nitin. May his soul rest in peace. There are many, many, not only in India but worldwide, that will miss Girish. He will be an inspiration to many men and women who's life his work touched. With deepest respect, and condolences to his family and colleagues. He wrote in regional periodicals about 'PRAYS' work. The writing was inspiring, informative and at the same time had no ideological influences. Though I never had opportunity to know him as you or other people who has commented, I met him once and know people who work in ' PRAYAS'. And from those people and their work, I can guess about how good he was as leader and person with vision. I was looking forward to learning a lot from him. And then, he is no more. We have lost a good friend and the country a committed energy analyst.